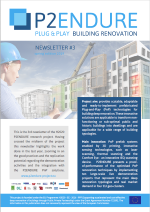 Plug-and-Play product and process innovation for Energy-efficient building deep renovation. P2ENDURE promotes evidence-based innovative solutions for deep renovation based on prefabricated Plug-and-Play systems in combination with on-site robotic 3D-printing and Building Information Modeling (BIM), demonstrated and monitored at 10 real projects in 4 geo-clusters with EU-wide replication potentials. A large number of innovative solutions for deep renovation have become available from recent EU-funded research projects. What is urgently needed is to increase the scale and level of adoption through innovative combinations, processes and supporting ICT tools. P2ENDURE will resolve the main barrier for wide-scale implementation of innovative solutions: the absence of solid empirical evidence that such innovative solutions deliver the expected performance, both energetically and financially. P2ENDURE will also create the supply-chain infrastructure for large-scale commercial implementation and upscaling of prefab deep renovation solutions. Build further on credible state-of-the-art solutions of 3D scanning and printing technologies in combination with prefab renovation systems, which are derived from tested results of recent EU and national R&D (Research & Development) projects. Develop modular processes for deep renovation through BIM-based design, engineering, production and installation for speeding up the implementation of the state-of-the-art solutions. Optimise and integrate the state-of-the-art solutions grounded in practical evidence of their performance through real deep renovation cases of public and residential buildings. Perform real deep renovation projects at a higher complexity level and with a larger performance impact than typical residential buildings through transformation of obsolete public and historic buildings. This research project has received funding from the European Union’s Executive Agency for Small and Medium-sized Enterprises (EASME), within the H2020-EE-2016-2017 call, under Grant Agreement no 723391.